2008 has been a tough year for American auto manufacturers. Faced with high gas prices and strong competition from overseas, sales have plummeted, especially in the traditionally lucrative light truck and SUV segment. Much like in the 1970’s, the pain at the pump has driven consumers to smaller, more efficient models, many of which are made in Japan. Although the Big Three already have some fuel efficient compacts and hybrids for sale, or in the works, is it too late to convince the American consumer that Honda and Toyota aren’t the only ones meeting the MPG challenge? The folks at Saturn would undoubtedly answer this question with a definitive “No!” Saturn was founded as a company dedicated to small, reliable, efficient cars. Although that mission changed a few years ago and Saturn now offers an array of different sized cars and SUVs, the brand is at the forefront of GM’s effort to go green. Green Line versions of both the VUE compact SUV and AURA mid-size sedan made their debut in 2007, but due to their “mild” hybrid systems and minimal fuel-efficiency gains, interest has unfortunately been mild as well. After undergoing a significant makeover, the VUE Green Line returns for 2008 with a fresh new exterior, upscale interior, revised road manners, but the same minimally augmented powertrain. For a full hybrid, consumers will have to wait until the 2009 VUE Green Line, which will feature a version of GM’s two-mode hybrid system. Until then, this modest attempt at fuel sipping should convince at least a few consumers to sign at the dotted line, but definitely won’t cause Honda or Toyota executives to lose any sleep. 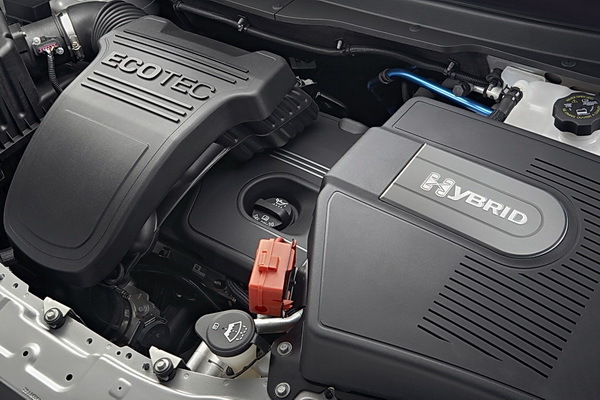 Like other hybrids, the hybrid system in the VUE Green Line consists of a standard gasoline engine mated to an electric motor and a rechargeable battery. Unfortunately, the VUE’s electric motor only puts out about 5 horsepower and is limited to mildly boosting the output of the 170 hp 2.4 L Ecotec engine. No silent running on electric power here, although the system automatically kills the engine when stopped and seamlessly restarts the motor when you release the brake pedal. The end result of this modest attempt at hybrid technology is a decent increase in fuel efficiency over the gas-only VUE: 25 mpg in city and 32 mpg on the freeway, compared to 19 city and 26 fwy for the base 4-cylinder version (EPA ratings). Combine this minimalist hybrid system with a conventional 4 speed automatic transmission with widely spaced gear ratios and you get some seriously sluggish acceleration. Whatever boost the electric motor gives is hardly felt and the gas engine feels even less potent than its 170 hp suggests. 0-60 takes an agonizing 11 seconds, a full 3 seconds slower than a Nissan Rogue, which amazingly has the same horsepower rating (but does feature a CVT that helps maximize performance). Once up to speed, the engine does a decent job of keeping the car rolling, but forget about any driving excitement. Freeway passing requires a clunky downshift into second gear, after which the engine slowly crawls to its 7,000 rpm redline. This is the car Mr. and Ms. Slowsky would buy. Part of the blame for this sluggishness must also go to a healthy curb weight of over 3,800 lbs., which is fully 500 lbs heavier than much of the competition in the small crossover segment. This extra heft does give the VUE a very composed, buttoned-down ride and the suspension does an excellent job of balancing ride quality with enough firmness to keep the VUE firmly planted on the road. GM’s borrowing from its European Opel division for the Saturn lineup seems to be paying off big in the ride department (in Europe the VUE will be sold as the Opel Antara). Steering response is also quite good and the brakes are solid with excellent pedal feel. Build quality is definitely a notch above the typical GM rattletrap from 10 years ago. If anything, the engineers went overboard in giving the VUE a solid foundation, given its high curb weight. The chassis is unflappable over rough roads and the body panels, doors, and windows are solidly put together. 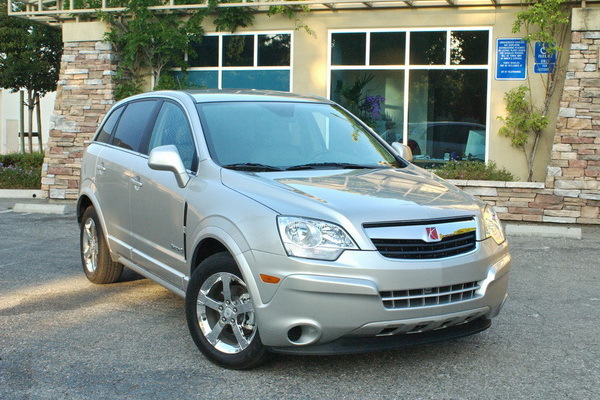 When it comes to safety features, Saturn didn’t skimp, with ABS, traction control, stability control, and a full complement of airbags all standard equipment. What, no lynch squad from the I-love-my-Green-Line-posse?